SCRAPiVERSE: This Tuesday: CRAFT WARS with COMMENTARY! Check it out, crafty hookahs. This Tuesday, I'll be joined by the great and hilarious DARLA for CRAFT WARS COMMENTARY: LIVE! Come join in the fun over at the forum at SCRAPBOOK.COM. With any luck, it'll turn into an all-out brawl. Speaking of possibilities for all-out brawls- yes, I have been in a few bar-fights in my day, but for real- I thought something was gonna break out during the class, yesterday. Somebody mentioned Craft Wars and the volume in the room grew so loud so fast- I backed up. I heard the rise in volume and started planning emergency exits. Clearly, there's lots of anger towards this show. And this is one of my tips for successful living: When you enter a room, always plan emergency exits and spot at least three items which can function as a weapon, should the need present itself. Craft Wars: I don't have anger towards it- I don't LIKE it, but I don't hate it, either. It does provide plenty of unintentional hilarity. That, my friend, is my favorite kind of hilarity. But it does sadden me. It was a chance for there to be a fun craft-related competition show. One of you- maybe not one of you, it was either here in the comments or over at the scrapbook.com forum- mentioned CRAFT CORNER DEATHMATCH. I had never ever heard of it, so went immediately to Google. There are a few episodes uploaded to Vimeo. Entire, commercial free, good quality videos. In other words, a rare and lucky gift from the Craft Gods. I'm in love with CRAFT CORNER DEATHMATCH, now. I'll just abbreviate it as CCD from now on- y'all know how I love to come up with abbreviations for things. CCD ran on the Style Network back in 2005. Remember when Style was a good channel? Remember The Brini Maxwell Show? I am still in love with Brini. I even have her book. To this day, whenever I come up with a clever idea, I look at the nearest person with a slightly tilted head and say, 'Now, why didn't you think of that?!' I don't do it justice. You need to see Ms. Maxwell's delivery. Pure genius. t still can't figure out how I missed this show. Because I either have a drive to force you to love the things I do -or because, since you're even reading my blog, we must have similar taste- I've included a link to a YouTube 'Best of Brini Maxwell' link. For some reason, it doesn't include her 'Now, why didn't you think of that?' catchphrase- and that's just a dirty shame. CCD is exactly what CRAFT WARS should've been- loud, crazy, wild, hilarious, FUN - and above all, actual CRAFTS. Not CONSTRUCTION. How the hell can a craft competition show NOT be fun when the 'surviving' contestant must battle 'The Craft Lady Of Steel' for the win?! And how freakin' cool is the Craft Lady of Steel? Here is a link to Vimeo, with some episodes of CRAFT CORNER DEATHMATCH for your viewing enjoyment. It's fun. Just do it. And don't forget to join me 'n Darla on Tuesday night for CRAFT WARS COMMENTARY: LIVE! -p.s. here's the 'Best of Brini Maxwell reel that I mentioned. Enjoy! -p.s.s. 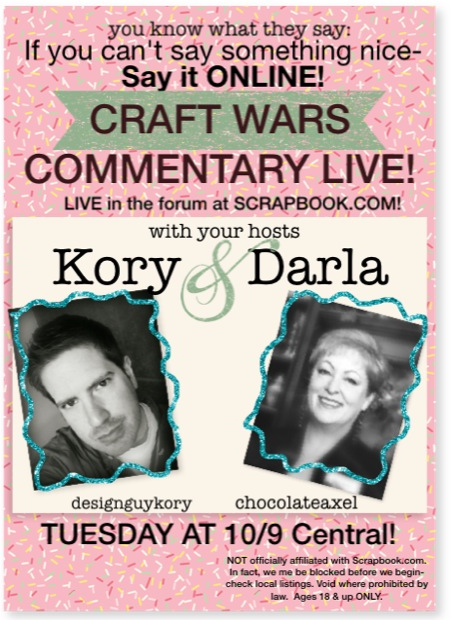 please note the text (blurry as it might be) on the bottom of the Kory & Darla Craft Wars Commentary poster- this 'special live event' is not officially affiliated with scrapbook.com, and we might even get kicked out of the forum before we begin. But hey- even if we draw one or two new people to the site and their forum, we've succeeded in something positive for them, right? Right!